Palestinian boys raise their hands in a school run by the UNRWA. Photo: UN Photo/Shareef Sarhan. U.S. Representative Ed Royce, (R-CA), Chairman of the House Foreign Affairs Committee. Photo: U.S. Congress. "Chairman of the U.S. House Committee on Foreign Affairs Ed Royce (R-CA) lambasted the United Nations Human Rights Council on Friday for adopting a resolution condemning Israel over alleged war crimes during last summer's Operation Protective Edge. Today, the U.N. Human Rights Council kept up its record of bombarding Israel with biased and shameful resolutions. The goal of this international campaign against Israel is to question the democratic country's right to self-defense to the point of rendering it virtually meaningless,' he said. The resolution passed on Friday was written by the Palestinians and Arab states, and welcomes the U.N. report on the 2014 Gaza war. It ignores completely Hamas' indiscriminate firing of rockets at Israeli cities, as well as alleged war crimes by Palestinian groups in Gaza, though several were indicated by the report. The resolution passed the UNHRC with full European backing, and the U.S. was the only country to vote against it. Five countries - India, Kenya, Ethiopia, Macedonia and Paraguay - abstained..."
"I have no interest in debating the content of the Resolution. It is an anti-Israeli manifesto. I will state, however, that the Resolution distorts the intention of the authors of the Report by completely ignoring alleged violations of International Human Rights Law and International Humanitarian Law committed by HAMAS and other Palestinian armed groups. Hamas continues to fire rockets and terror acts against Israelis go on as I speak. So allow me to tell you the truth about what Israel did in Gaza. One-Israel defended its population against aggression by a terrorist organization. A terrorist organization which serially rejected every cease-fire proposed. Two-Israel went to extraordinary length to minimize the impact of the violence on Gaza's civilian population. It went to great length to warn the civilian population on impending strikes. Three-Israel is fully committed to investigating all alleged violations of the Laws of Armed Conflict. Israel's investigative mechanism has already filtered close to 200 cases. Over 100 of these cases have been handed over to the Military Advocate General. Four-however, Justice must be done, first and foremost. The Chair of the Commission of Inquiry has stated in her press conference that Israel has a robust system for investigating alleged violations. It must be allowed to complete its course. Five-Israel is carefully studying all reports on Operation Protective Edge, whatever their source, flaws or bias. I believe these five points should satisfy any reasonable and fair demands of Israel. But we are not dealing here with fairness or moral integrity. We are dealing with a UN organ that is highly politicized, obsessive with Israel, ignoring serious situations of human rights violations across the globe and spending its scarce resources of money and manpower on reports on my country. This Council will not succeed in de-legitimizing Israel. This Council will not succeed in preventing Israel from defending itself and its population. This Council has failed to be a constructive player and promote rapprochement between Israelis and Palestinians. This Council acts as a agent provocateur feeding the flames, not extinguishing them..."
At least 150 people have been killed in an attack believed to have been carried out by Boko Haram militants in Nigeria's north-eastern Borno state. According to witnesses, gunmen stormed through the village of Kukawa near Lake Chad on Wednesday, killing 97 people, including women and children, reported the BBC. In a separate attack carried out on Tuesday, militants gunned down 48 men after they had finished prayers in two villages near the town of Monguno, a resident said. The town had recently been captured by the terrorist group. At least 17,000 people, mostly civilians, have been killed since 2009, when Boko Haram launched a deadly offensive to try to impose militant Islamist rule, according to Amnesty International. Although the United Nations claims to condemn bigotry and racism, UN meetings routinely feature antisemitic language. The UN's Committee on the Exercise of the Inalienable Rights of the Palestinian People sponsored a two-day conference entitled "UN International Meeting in Support of Israeli-Palestinian Peace" in Moscow on July 1-2, 2015. On day one, the representative of Morocco lamented the Jewish presence in Jerusalem and implied that authentic Jerusalemites are not Jewish. In his words: "Morocco's King ... was sponsoring field projects to help Jerusalemites preserve their religious and cultural landmarks in the face of the Judaization of the city. " Notwithstanding this effort to rid Arab-claimed land of Jews, and create what will be "apartheid Palestine," Riad al-Maliki, Foreign Minister of the Palestinian Authority said: "It is either a two-State solution on the 1967 borders or an apartheid reality the world cannot tolerate," and Nabil Elaraby, Secretary-General of the League of Arab States, accused Israel of being the "last outpost of apartheid in the twenty-first century. " More accurately, one-fifth of Israel's population is Arab, with more democratic freedoms than in any Arab state. Moscow is playing host to a two-day conference, entitled "UN International Meeting in Support of Israeli-Palestinian Peace," and sponsored by the UN's Committee on the Exercise of the Inalienable Rights of the Palestinian People. "commended all States, businesses and organizations that supported the movement to boycott Israel and called on the international community to adopt a legal position to end settlement expansion in the West Bank and the Judaization of East Jerusalem." said the Israeli government is actively working to ensure " the Israeli apartheid became systematic." "We [Arabs] are the rightful owners of the country, we are not guests." Known for their barbaric punishments and repressive control over the locals, ISIS have released photographs of militants hurling four men, accused of homosexuality, off the top of a building in Iraq. The jihadi group has previously carried out the sickening punishment in their de-facto capital, Raqqa, in Syria. Now the inhumane death sentence has been used in the Iraqi province of Fallujah. ISIS's latest propaganda images come after a family of 12 British nationals, including two grandparents are feared to have traveled to Syria. With their arms bound tightly behind their backs and their eyes fully covered with a makeshift blindfold, each victim is shown being led to the edge of the tall building. At the command of a senior ISIS officer, the two militants appear to grab their victim around his wait and hoist him to the edge of the rooftop. All four victims are then dropped from the lofty height to their deaths. Several photographers appear to have been used by ISIS's media team in order to capture the victims on the roof and on the ground. The gruesome propaganda photos appear to be an attempt by the depraved militant group to reinforce its rule of fear. The final photo, too graphic for publication, showed the impact of the head injuries suffered by each of the victims. Unusually for an ISIS public execution, no local civilians or ISIS militants appear to have come out and watched the men's death. ISIS's propaganda photos are normally filled with people watching the punishment. The extremist group have become known for their tough punishments, with theft punished by the amputation of a hand and the consummation of wine punished by a flogging. [T]he writers [of the rules of law] cannot know whether they will be male or female, gay or straight, white or black, handicapped or fully able, Jew or gentile, handsome or ugly, strong or weak, smart or not so smart, poor or rich, healthy or unhealthy, etc. etc, when they draft the rules that will govern their future conduct. How then do these general principles, about which there is universal agreement in theory, apply to the subject of our discussion today? Directly! The way Israel is being judged today is a dramatic exception to the rule of law and the principles articulated above. Under the current approach, the international community first considers Israel's actions, in isolation from the actions of other nations; it judges them to be imperfect, when evaluated against abstract rules; it then creates specific rules applicable only to the nation-state of the Jewish people, and to no other nation. 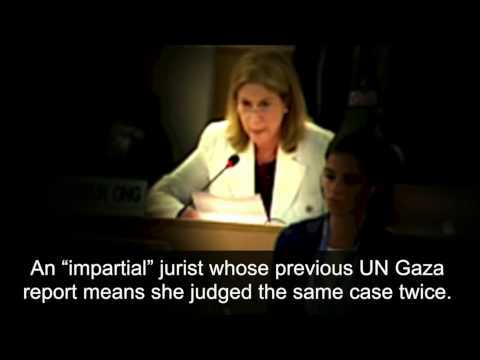 This has clearly been the case with the Goldstone Report, the more recent report by Mary McGowan Davis, the decisions of the International Court of Justice, the resolutions of numerous United Nations bodies, especially the misnamed Human Rights Council, and even the reports of Israeli NGOs such as B'tselem and Breaking the Silence. These so called applications of the rules of international law all share a common modus operandi: they begin with Israel's actions rather than with neutral principles of law designed to govern the actions of all nations and groups. They then judge Israel's actions against unrealistic, anachronistic and abstract principles that could not be, and have never been, applied to other nations or groups. They then condemn Israel, without articulating rules of general applicability..."
I expect you to condemn the terrorist attacks in Israel in an equally decisive manner. Terror is terror, no matter where it takes place, or who is harmed. The people of Israel deserve the same level of concern and empathy as any other people in the world." It is believed to be the first time ISIS have executed a woman in Syria for crimes of 'witchcraft' and 'sorcery', the Syrian Observatory for Human Rights monitor said today. 'The Islamic State group executed two women by beheading them in Deir Ezzor province, and this is the first time the Observatory has documented women being killed by the group in this manner,' Observatory chief Rami Abdel Rahman said. The Britain-based monitor said the executions took place on Sunday and Monday and involved two married couples. In both cases, the women were executed with their husbands, with each pair accused of witchcraft and sorcery. The Islamic State group has become infamous for gruesome executions and is reported to have stoned women to death on allegations of adultery. But the Observatory said this was the first time it was aware of the group beheading women. According to the monitor, IS has executed more than 3,000 people in Syria in the year since it declared its Islamic "caliphate" in Syria and Iraq. Nearly 1,800 of them were civilians, including 74 children. The public execution of so-called 'magicians' and 'sorcerers' have been confirmed by ISIS. Street performers, entertaining young children and passersby have been put to death for crimes of magic and sorcerers. Optical illusions and other basic magic tricks are considered strictly forbidden and a form of black magic, an art condemned as questioning the existence of Allah. Last month, ISIS's Libyan franchise, released their first images of a sorcerer being beheaded in the province of Barqah. Forced into wearing a grisly orange boiler suit, the man was forced to confess his alleged 'crimes' and accept his death sentence. One of the images released as evidence of his guilt included a manuscript, covered in hand written Arabic in blue ink. The document is alleged to be some sort of spell or proof of black magic. ISIS also released photos of a magician being decapitated in the Iraqi province of Salahuddin. A close up image of the man's broken body shows a broken bag full of prayer beads lain near his body. ISIS claim the beads are trinkets and charms, a form of black magic condemned by the jihadi group as an act of blasphemy. British Col. Richard Kemp addresses the UN Human Rights Council, contradicting a recent report on the 2014 Gaza war. "Increasingly, human rights organizations are attempting to make military forces operating under the purview of the Laws of Armed Conflict subject to persistent human rights claims in the civil sphere. Israeli soldiers have historically been made the mark -- much as they are being made now by the U.N. Human Rights Council. But such moves mask a broader agenda that should worry the entire West. Western nations pursue war only after careful deliberation leading to a conclusion that war is necessary and just. Once that conclusion has been reached, however, a war must be fought to be won." "During last year's Gaza war, Hamas did more to inflict death, suffering and destruction on its own civilian population than any other terrorist group in history, Colonel (ret.) Richard Kemp said on Monday. Kemp stressed that the IDF made 'unprecedented' efforts to save Palestinian civilian lives, including warning them to leave target zones. It was Hamas, and not Israel as the UN says in its report, that caused thousands of civilians to be killed in Gaza, Kemp said." This latest UNHRC inquiry and report is only as reliable as its sources of information. When these are overwhelmingly unreliable political NGOs, as well as those who support and facilitate terrorism, any true champions of human rights cannot take its findings seriously." Thus the bottom line is the same as that emerging from the UN's Gaza inquiry: International law leaves democracies no options in the face of determined terrorists except capitulation. You can't fight them, because then you're guilty of war crimes. But you also can't arrest and jail them, because they can simply start a hunger strike, which entitles them to a get-out-of-jail-free card..."
Hamas is not the only Palestinian force that is guilty of crimes worthy of investigation. The PA has also funded terrorists and incited terror via its official media. Moreover, shining a light on the terrorism conducted by Palestinians last summer may also land Abbas and aide Jibril Rajoub in court. The Israel Law Center is preparing to send the ICC its own indictments of the PA leadership for acts of terror committed by Fatah affiliates directly under Abbas's control. Using their formidable propaganda machine assisted by an international press that is always prepared to judge Israel affair, Palestinians have been able to demonize the Jewish state in the court of international public opinion. But any real court, even one as biased as the ICC against Israel will also have to look at the far more credible criminal charges that can be laid at the feet of both sets of Palestinian tyrants. Once investigations begin, PA is as vulnerable as Hamas no matter how much sympathy they generate in a Europe where anti-Semitism is on the rise. By going to court, they have opened a Pandora's Box with consequences that few can predict..."
Country after country attacked Israel for apartheid, occupation, violation of human rights and freedom, searches on the Al Aqsa mosque on the Temple Mount, crimes and the violations of human rights. Morocco claimed that Israel is harming the 'Islamic identity' of Jerusalem..."
"Israel's representative to the United Nation's Human Rights Council on Monday blasted the international organization for being 'morally flawed,' as the findings of a UN report on the Gaza summer conflict were presented to the council. Eviatar Manor, who represents Israel in the UNHRC, did not attend the day's session in protest and instead delivered a scathing condemnation outside the UN building in Geneva. 'I am out here and not in there because the Human Rights Council has abandoned fairness, has become morally flawed and has entirely politicized its concern for universal human rights,' Manor told reporters..."
"Nearly one-quarter of the U.S. Senate signed on to a bipartisan letter urging President Barack Obama to support Israel around the world. Twenty-two senators signed the letter, which was written 'in response to your welcomed recent remarks at Congregation Adas Israel' on May 22 concerning his commitment to Israel's security. The letter was sponsored by Sens. Mike Rounds, R-S.D., and Kirsten Gillibrand, D-N.Y. The signers wrote that they were 'deeply concerned by previously reported and unattributed comments by U.S. officials that the U.S. might change its approach to the peace process at the United Nations Security Council...'"
"Some 1,000 demonstrators attended a rally Monday at the Place des Nations in Geneva to express their support for the State of Israel as the United Nations Human Rights Council held its debate on Israel and the Schabas Report on last summer's counter terror operation in Gaza. Members and supporters of more than 80 NGOs, including many Jews and Christians, travelled to the Swiss city to express their support for the Jewish state and to urge the U.N. to treat Israel fairly. 'The reason we are here today is to tell the United Nations that it needs to change. It needs to overcome its obsession with Israel," said World Jewish Congress (WJC) CEO Robert Singer..."
But Abbas need not worry. Barack has got his back. State Department spokesman Edgar Vasquez told Al-Monitor that while the United States doesn't believe the Palestinians were eligible to accede to the Rome Statute and join the court, it will 'continue to provide critical assistance to Palestinians in the West Bank and Gaza...'"
"The U.N. report on Operation Protective Edge was predictable. The harsh and one-sided criticism of Israel, the turning of a blind eye to Hamas' war crimes and the piercing remarks against Israel proved that nothing has changed in regard to the U.N.'s lack of fairness and fairness. The Israeli government's response to the report, ranging from disregard to criticism, was legitimate, but not something that would change the balance of the relationship between Israel and the U.N. The extent of the condemnation Israel has endured from the U.N. and several of its subsidiary bodies is enough to understand the biased rules of the game the U.N. is playing. UNRWA and UNHCR both work with displaced persons. UNHCR is responsible for integrating refugees in their host countries, while UNRWA focuses solely on refugee aid. In effect, UNRWA helps Palestinians preserve their refugee status and pass it on from generation to generation, contrary to the logic and policy of UNHCR. Refugees living in Arab countries are ostracized, persecuted and devoid of basic human rights. This is the main harm caused to Palestinian refugees by UNRWA..."
The name 'Human Rights Committee' provides a smokescreen of bogus good intentions, declaring to the innocent that the UN is helping protect all of us. Millions of people who are unaware of its record have no doubt gathered from the latest report that Israel is as worthy of rebuke as Hamas. In treating Hamas and Israel as equivalent, Judge Davis has blackened the name of the UN and its many offshoots. This one might more accurately call itself the United Nations Committee on Defaming Israel." "Prime Minister Binyamin Netanyahu may sever Israel's ties with the United Nations Human Rights Council (UNHRC) after their inflammatory report over Israel's conduct during Operation Protective Edge in Gaza, he said Monday. Netanyahu called the UNHRC 'a hypocritical committee' during a closed session, according to Army Radio - prompting a response from former Foreign Minister Avigdor Liberman (Yisrael Beytenu). Netanyahu then responded that he will 'consider whether to stay in or leave the Human Rights Council...'"
"The United Nation's international investigation commission's report on Operation Protective Edge was submitted to the UN Human Rights Council in Geneva on Monday, with hundreds of pro-Israel activists expected to arrive outside. The shape of the draft resolution that will be brought to vote is still unclear, and recent days have seen behind-the-scenes efforts to forge a solid proposal. Pakistan was set to present -- in the name of the council's Islamic bloc -- a proposal to adopt the report and send it to an international body such as the UN General Assembly, the Security Council, the Secretary General, or the International Criminal Court in the Hague. Israel believes the proposal will pass a vote and support a mechanism to monitor its application. Jerusalem and its allies have already declared their opposition to any formulation that calls for putting the report before the Security Council. Israel has asked members of the Human Rights Council to oppose the report or least refrain from voting. Israel will not participate in the debate, but Israel's ambassador in Geneva, Eviatar Manor, will hold a press conference about it..."
"[W]hen it comes to the Middle East, moral clarity and truth are in short supply at the United Nations. [T]he UN Human Rights Council treats Israel as a worse violator of international law than the Syrian regime. The Secretary General's Children and Armed Conflict report undercounted the number of children killed in Syria while relying in part on Hamas-supplied figures in its estimation of the number of Palestinian children killed in Gaza. And the International Criminal Court has launched a preliminary investigation of the war in Gaza while repeated requests to refer the Syrian conflict to the International Criminal Court have stalled in the Security Council. In closing his remarks at the anniversary celebration of the UN Charter's signing, Secretary General Ban Ki-moon said that 'The Charter is our compass.' Too often today, the UN has lost its way, as so vividly illustrated by the moral equivalence, if not worse, it applies to the Israeli-Palestinian conflict and the massacres in Syria."